The Nokia C5-03 isn't mind-blowing, but it isn't dud either. Upon first touch, the Nokia C5-03 is sleek but not stunning, chunky but light enough, and rocks minimalistic buttons, touchscreen capability and a shiny derriere. But if you were picking up this smartphone in the hope that it might provide some real competition in the mid-range budget area, you may be in for a little disappointment. The Samsung Monte offers a better range of pre-loaded apps. The HTC Wildfire has a better UI and LED flash for the camera, and the mid-range Blackberry Curve 3G has email pretty much covered. 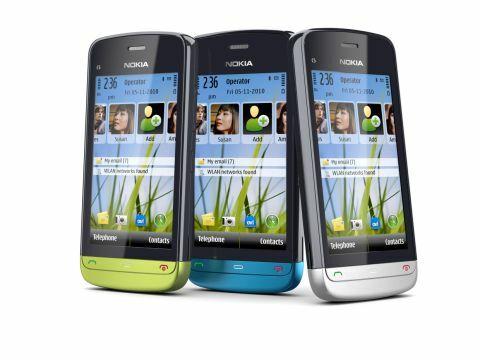 So what exactly is the Nokia C5-03 offering other than an extra '-03' on top of last year's Nokia C5? Measuring in at just under 14mm, the handset is a little bigger than Nokia users might expect, but handily compact for everyone else. Its rounded edges fit nicely in the hands, especially small ones, and while the depth might be an issue for some, we felt it gave the light handset (93g, thank you!) a little solidity and stopped the plastic-cased phone from feeling too cheap. That said, it didn't prevent a hairy moment when removing the battery cover for the first time – the thin piece feels imminently snappable, which makes for a scary experience if you're, shall we say, as ham-fisted as we are. The contrasting coloured end is a nice aesthetic addition, but is ultimately useless, though it allows for users to do a little outfit matching, if that's your thing. The loudspeakers are located there, though, which are perfectly loud and emit a nice, clear sound. On the shiny back sits the five-megapixel camera, which is an improvement over its predecessor. There's no front-facing camera, so video calling is out. All sockets, ports and buttons are present and correct. There's a charger socket, mini-USB socket (also for charging if necessary), 3.5mm audio jack, volume rockers, keypad lock button and place to put that lovely From Me To You Bear wrist strap you've been hoarding since the 90s. There's also a microSD memory card port for up to an extra 16GB of storage to hold your morning commute podcasts, which are easily grabbable from both your computer hard drive and the Ovi podcast store. But should you get bored of those, a built-in accelerometer enables gameplay of modern classics such as Doodle Jump. Hours of fun right there.